Mark 1 Podium Steps Hire. UK Delivery, £28 Per Week. Hire the well respected and widely used mk1 podium steps by interlink. Available for next day delivery from lakeside-hire. The compact podium steps Mk I are a safe alternative to step ladders and scaffold towers for builders and DIYers alike. With a working platform height of 1.17m, this versatile piece of kit offers contractors the ideal secure base when working at height. The Mk I podium steps consist of an aluminium construction weighing less than 25kg which makes them lightweight and easy to manoeuvre when you need to keep adjusting your working position. The podium steps conform to all the current regulations and have been manufactured to the highest safety specifications and quality assurance. Other benefits include an extended guard rail, and a safe anti-slip platform deck offering a 360 degrees working area so you can reach to the limits of your working area in complete safety. The Mk I podium steps also fold flat so they are easy to transport, handle and can beassembled in just seconds. Also included is a deeper back section offering more stability to the entire structure along with the required guard rail, easy-to-operate gate, swivel locking castors and locking hooks. And the aluminium anti-slip steps and decks make the podium step Mk I the ideal solution where wooden components are no longer endorsed in places like the London Underground. 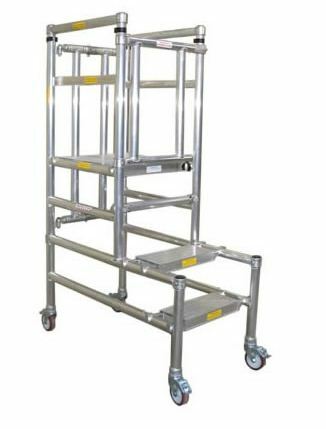 It is so safe whether you are working alone or as part of a team, telescopic side frames extend and lock into position to provide a side hand rail when working at height. That means no more perching on wobbly ladders or puzzling out how to erect a scaffold tower. The Mk I is a safer alternative to builders steps and not as cumbersome as a scaffold tower making it ideal for those small odd jobs both inside and out.